I think I mentioned that my bike was packed in the Evoc bag. On arrival unpacking and reassembling the bike took about 5 minutes, compared to the usual 20. I can't recommended the bag enough - it was even easy to drag around the airport. I was enjoying it so much I asked to take it with me as hand baggage but despite repeated attempts I couldn't get it to fit in the little sizing cage at check-in. We ate, we drank, we talked. We girded our loins for the next day. Mountains? How hard could they be? Oh. My. God. I. Need. Oxygen. Must. Slow. Down. Or. Fall. Off. 14% for next Km. 12%. 12%. 7%. 5Km to top. Ow. Ow. Ow. 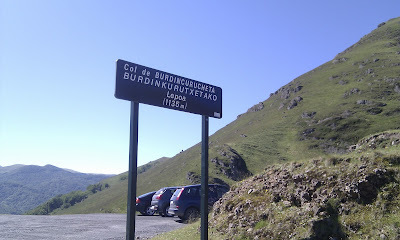 Looking back, the first climb was always going to hurt. Nothing to do with the length, or the gradient, or the heat. All to do with it being the first climb of the trip. This was where we started to sort out "the order". "The Order" is the unspoken King of the Mountains competition. No-one admits they are trying, no-one talks about it before it starts, but once that first big climb of the trip comes up gears are shifted, pedals are stood on and heart rates go to maximum. I hit the steep start hard, putting 20m into the second placed rider. Then I realised that this wasn't a 500m Cotswold climb but lasted 8Km. Oh. A few hundred metres further on and I was now the second placed rider. Bah. I was also in a lot of pain. Somehow I got it under control and vowed two things. 1. To respect my position. I wasn't the best climber. 2. To never hit a big mountain climb that hard again. The new tactic was to start slow, and continue slow. 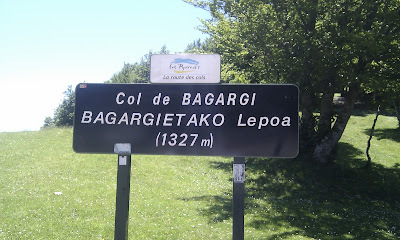 Only 1135m. Only! The highest point around here is 230m. It was also one of the steepest of the whole trip with some very nasty sections. The second Col, which although was higher was much less steep. We had lunch at the top, where we were amazed to discover that was it for the climbing - the rest of the day was downhill to flat, pretty much. Which was nice. Tomorrow - some Cols you may have heard of. Hey Brian...Great to find your site, via Gerry's. I've been here a few times, but couldn't get a comment to post. Now I think it is a browser issue. I used an Evoc bag too and it worked well for me. We have ridden a number of,the same cols and I look forward to reading more of your trip! Thanks for,the link.